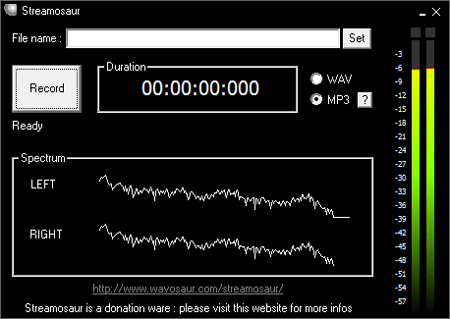 Streamosaur is a Free tool that can be used to Record Streaming Audio as WAV or MP3 files. It is one of only a few entirely Free Streaming Audio Recorders available. Aside from having the ability to record audio from any web stream or internet radio broadcast like Pandora, Streamosaur can record all audio from your sound card, microphone, input lines from external mixer, tape player, record player etc. Pretty much any audio played through your computer can be recorded and saved as an MP3 or WAV file.